HydroMax Inc. — HOW DOES A WATER SOFTENER WORK? Water softeners use synthetic resin beads to remove potentially troublesome “hard” water minerals (minerals are called ions after they have been dissolved in water) from normal tap water in order to decrease equipment maintenance, increase system efficiency and lengthen the service lives of certain water purification system components by eliminating the possibility of developing hard mineral deposition on this equipment. Water heating equipment and water purification membranes are two types of equipment that are susceptible to mineral deposition and subsequent fouling. Hardness mineral free water is referred to as “soft” water. 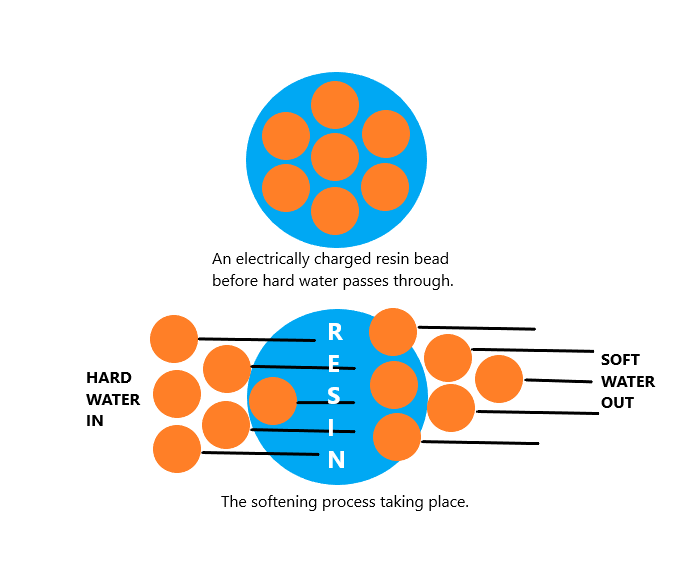 Water softener resin beads contain ion receptor sites which initially hold only sodium ions. As tap water that contains “hardness” ions (calcium and magnesium) passes through the resin, the calcium and magnesium ions are attracted to the beads, and are exchanged for sodium (“soft water ion”). This process is called ION EXCHANGE, since there is not a net removal of material from the water, simply an exchange of two TYPES of ions. This exchange continues until there are no longer any sites at which the exchange can take place. The resin is then considered “exhausted” and must be recharged with sodium ions in order for the unit to continue working to remove hardness ions from the feed water. During the recharge, or regeneration, process, a concentrated sodium brine solution is rinsed through the resin. The resin prefers sodium ions, when present in higher than normal concentrations, over calcium and magnesium ions, so calcium and magnesium ions are bumped off and go down the drain, while the sodium ions fill all the available receptor sites on the water softener resin beads. The resin is then ready for continued service.